To celebrate Youth Arts Month, Ridgefield Community Education is offering a phenomenal array of classes for the community and for kids of all ages. Many classes are free! View the Ridgefield Youth Arts Month 2018 brochure here or visit the Community Education page at www.ridgefieldsd.org and click on 2018 Catalog. All classes require online registration and are available on a first-come, first-serve basis. If you find a class full, sign up for the wait-list. With enough interest, a second class may be added! Visit www.ridgefieldyoutharts.com for updated information. 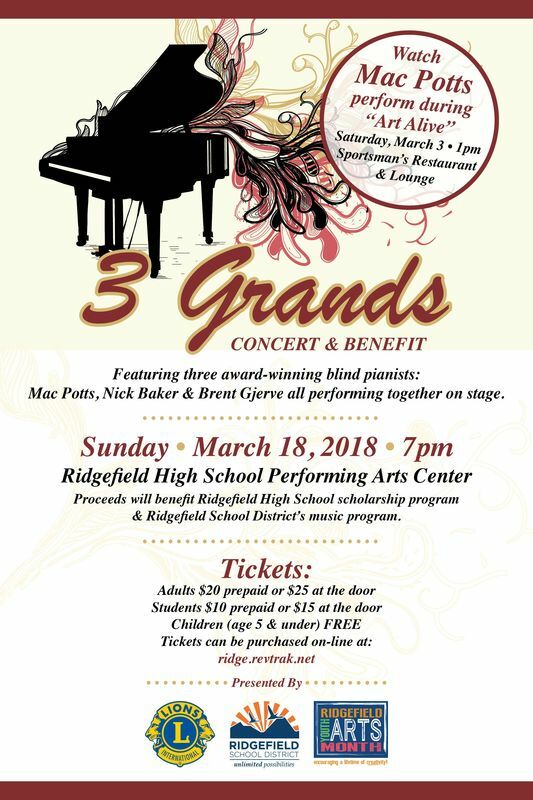 This year, Ridgefield School District and the Ridgefield Lions Club are pleased to present a special performance by three award-winning blind musicians, Mac Potts, Nick Baker and Brent Gjerve in an amazing piano concert, “3 Grands Concert & Benefit” on Sunday, March 18 at 7:00 pm at the Ridgefield Performing Arts Center. Be prepared for a unique, awe-inspiring performance by these talented musicians. Proceeds benefit Ridgefield High School’s scholarship program and the Ridgefield School District’s music program. Tickets are now available online at ridge.revtrak.net. Be in the know! Join Ridgefield Community Education’s mailing list to receive periodic updates and reminders. Simply email “Add me” to terri.cochran@ridgefieldsd.org. A variety of Winter/Spring classes is now being offered. Visit the Community Education page at www.ridgefieldsd.org. Questions? Call Ridgefield Community Education at 360-619-1303 or email Terri Cochran at terri.cochran@ridgefieldsd.org.